Silk Base Hair system is the most faithful system in the market today. 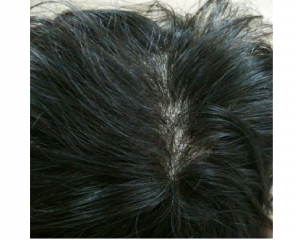 You can increase the presence of having a scalp that looks like your own because the roots in this hair system are invisible. Silk Base is made with a layer of lace & pure silk fabric at the top front of the cap. This hair System has hand stitched roots or hair knots which makes the scalp area provides the delusion that the hair is coming from your own scalp. It makes the knots 100% unseen. You don’t require to bleach the knots. In Silk Base Hair System, you don’t require to worry about the seen roots like any other system. We recommend different sizes of Silk Base Hair System for clients who may want to achieve a deeper side parting or flat twist the front area of their hair. Silk Base Hair System has a bigger parting area in the front. We suggest Silk-Based Hair for the expert lace hair patch wearer. Only a perceptive client wants a lot of styling options. This is completely perfect for clients with complete hair loss. It is a total skin base hair replacement system. We recommend a full silk base piece for natural looks. It is little expensive but it is worth the cost. Sometimes you require to try a few options to see what works best for you. Silk Base Hair System is truly the way to go as it allows you to take advantage of the unique attributes of individually hair system. Also, you are able to find the exact density, color, and style to make your hair look perfect. Silk Base Hair System is the most popular combination. Forget trying to hide or cover up the knots at the hairline. This hair system has hidden knots. Silk Base Hair System creates the delusion of a scalp. It is in stock and ready to ship. Silk Base Hair is shown in the photo.